The decision by the US President not to certify Iran’s compliance with the Joint Comprehensive Plan of Action (JCPOA), or “Iran nuclear deal”, means the UK needs to redouble its efforts to champion diplomacy, UNA-UK argued today. UNA-UK believes that President Trump’s announcement is as reckless as it is unnecessary. The deal brokered between the EU, Iran and the “P5+1” (the permanent members of the UN Security Council and Germany) in 2015 reduced tension in the region and verifiably halted Iran’s development of nuclear weapons. The deal was an exemplar of what can be achieved through the United Nations. Through compromise and diplomacy, a highly volatile situation was transformed into a situation of mutual benefit. Negotiation replaced empty posturing, and the risk of nuclear war was replaced by an opportunity for cooperation and human development. The message from the International Atomic Energy Agency, the UN body responsible for verifying the deal, has been unambiguous: Iran has lived up to its side of the bargain. And the world is more secure as a result. The Iranian regime is far from exemplary, particularly when it comes to human rights and fermenting regional instability. These are important issues that require a strong response from the international community. But these matters fall outside the scope of the deal, which focuses on Iran’s nuclear programme. Moreover, they are not going to improve if the deal collapses. On the contrary, the situation may grow worse, increasing the risks to regional and international peace and security. It is also likely to lessen further the appetite for a negotiated solution to North Korea. Punishing Iran for playing by the rules weakens the case for diplomacy. Kim Jong-un may well conclude he’d rather be hanged for a sheep as a lamb. The deal could still survive. 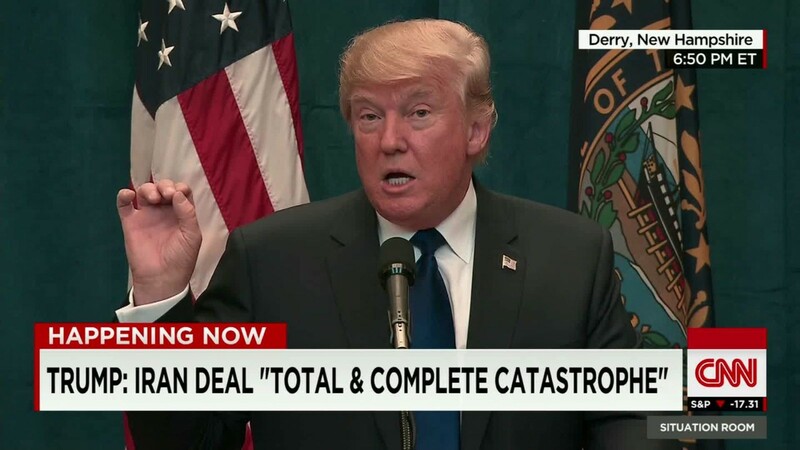 The US is not the only party to the deal and Trump’s announcement stops short of re-imposing US sanctions on the Iranian government, a decision which will need to be made by Congress over the next 60 days. The President himself indicated that he would be happy for Congress to keep the United States’ commitment to the deal alive, although it is unclear if the changes that the President desires Congress to make would be compatible with the agreement. The UK and the other European parties to the deal – the EU, France and Germany – must show a united front in championing the agreement. They need to make clear to Iran that they value its continued compliance and that despite this setback, they will endeavour to uphold their side of the bargain. They should also discuss practical ways to demonstrate that Iran’s future, and that of the region, will be brighter without nuclear weapons. The joint statement from Prime Minister Theresa May, Chancellor Angela Merkel and President Emmanuel Macron represents a welcome first step. The collapse of the deal could further destabilise a region already riven by war. It would also send a dangerous message about the value of negotiation, compromise and rules-based agreements – all of which the world desperately needs right now. The decision by the US administration has damaged further its reputation as a rational member of the global community. Others must step into the breach. This article was originally published on the UNA-UK website.